The Zeppelin Hangar is next to the Friedrichshafen Messe, or conference halls. Over the past few days, a massive Ham Radio convention has been going on. Our hotel has been full of people who come to breakfast wearing badges with their call sign instead of their names (and some who even had T Shirts and other clothing embroidered with it so that there could be no mistake!). 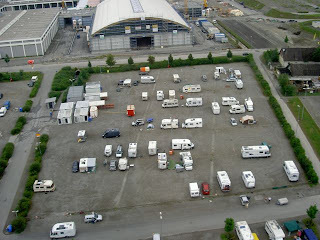 By today, the convention was over and the several fields of tents and RV’s that had been erected, along with the forest of antennae, had started to disappear. Just as well, NT003 was having communication challenges yesterday and the engineers had started to wonder if all the power at the end of the airfield was having an impact! Err, Where are we exactly?